My next condition was it has to come with nice casing – I won’t carry some unprotected dev board in my pocket – ideally an USB key. Devices recommended in project itself were either not available anymore or expensive or just plain boards. 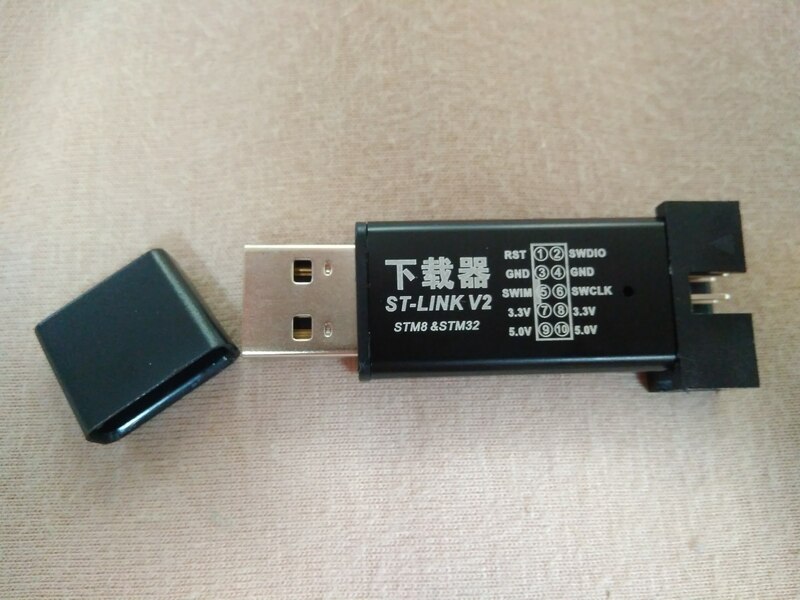 After a short research on google and aliexpress I found ST-link programmer clones. They are very cheap, have nice aluminium case and should contain STM32F103. So I ordered one. 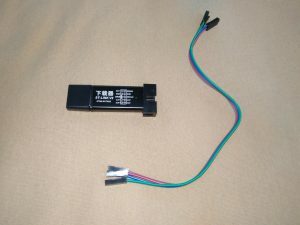 The advantage is that if you don’t have STM programmer, you can order two and you will have everything needed. 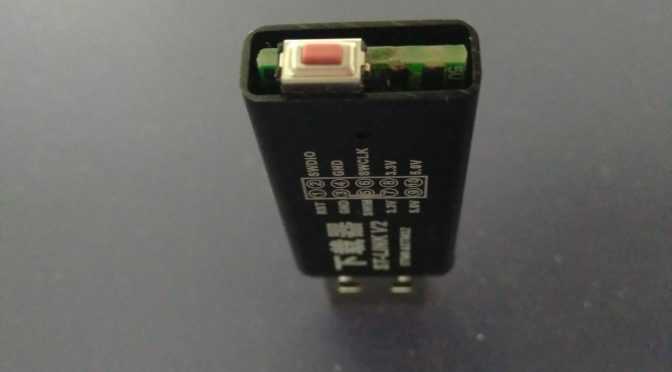 It was a little disappointment when I saw the chip – STM32F101CBT6 (128kB flash). 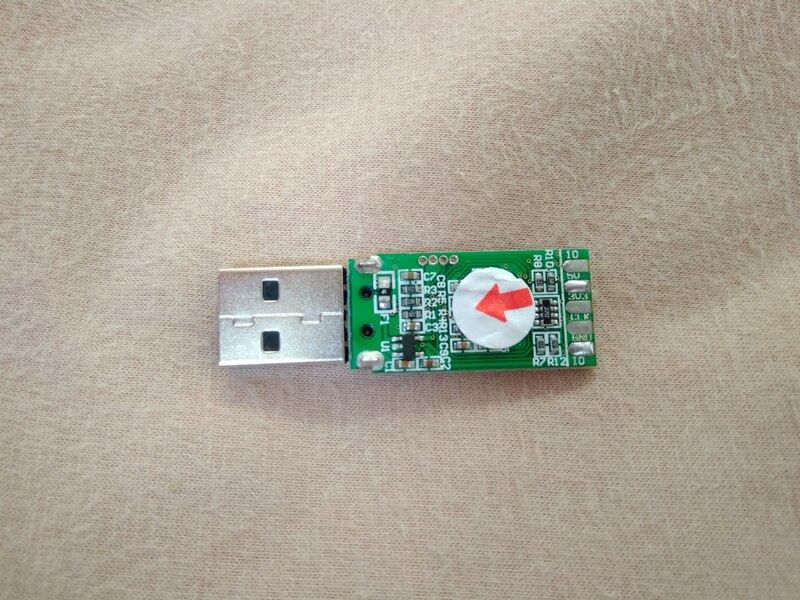 I was afraid that I’ll need to port the software and moreover according to specs it shouldn’t have USB phy so I though they bit-banged the USB interface. 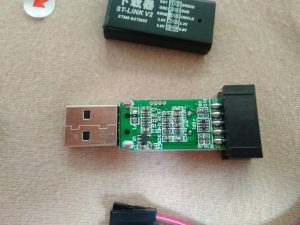 Then I found one page where they discussed these devices and and they mentioned that in fact they have USB and they are compatible with F103. remote: Counting objects: 11644, done. remote: Compressing objects: 100% (3812/3812), done. Receiving objects: 100% (11644/11644), 12.04 MiB | 1.69 MiB/s, done. Resolving deltas: 100% (8560/8560), done. For connecting using openocd I used a config which I had used before for F103. The device identified to PC as Gnuk! After some brief tests it was clear that it works. When I was happy with the function I was going to add a real button, so I desoldered the pin header. I’ve had some PCB button at hand and I wanted to solder it directly to the edge of the board. For this I needed one IO pin which will be in the right distance from GND pin. Unfortunately there no such pin. So as a workaround, I soldered the button between two IO pins (NRST, SWIM) and I set one of them (SWIM) to zero by firmware. 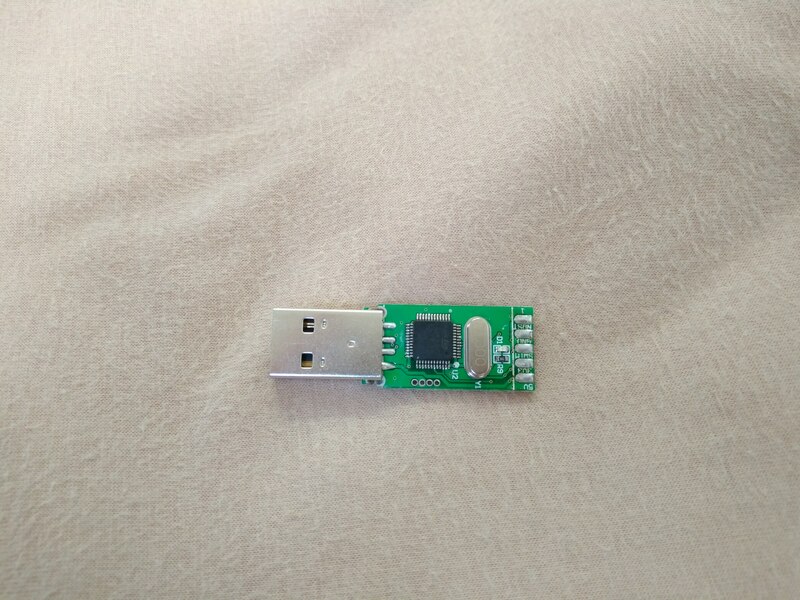 Now I have USB GPG token which is small, looks nice and have desired features. You can download my patches here gnuk-button. I’m going to provide just some crash-course here. Synchronizing state of pcscd.service with SysV service script with /lib/systemd/systemd-sysv-install. Now you can add this key to your server and try to log-in. Feel free to ask any questions or comment. I saw this article a few weeks ago and ordered two of these dongles almost immediately. They arrived today and I plan to get my hands dirty and test your project in a few days. One thing I noticed while setting up the code to compile is that the repos of gnuk and chopstx are a bit ahead and your code now has some limited “patcheability”. I’d suggest that instead of making the patches available, set up a repository with them already applied. This way everyone taking advantage of this wonderful discover can get the functionality you implemented and also receive the latest fixes for the original code. Nice work. Thank you! I wanted to include it in upstream but NIIBE doesn’t like this way of confirmation. Let me know if it worked for you. I think that keeping it as a fork is pretty fair for now. Anyway, I’ll try to merge your patches. Cheers. You did a good job detailing this post to a level, when even a novice can reproduce this project. I have ordered a pair of this tokens and successfully flashed the firmware. Here is some tweaks that I had to do. 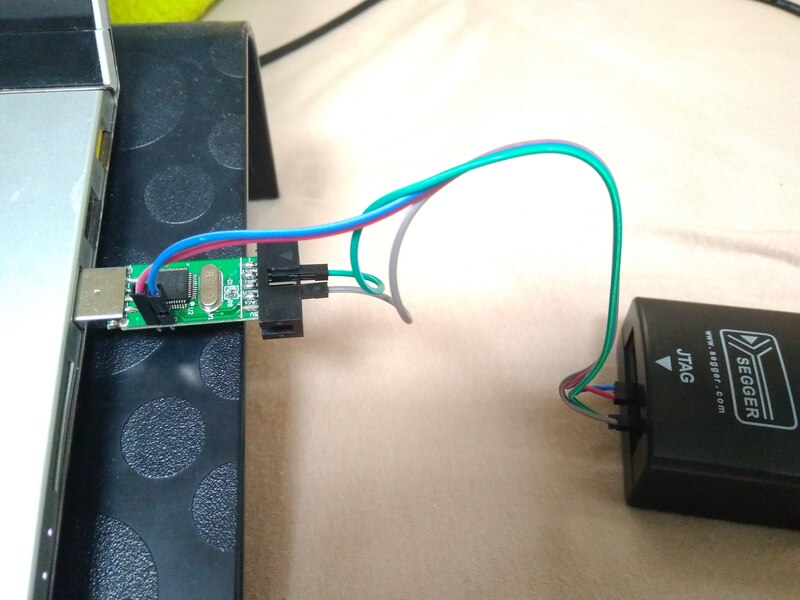 To fix this just plug in both programmer and token to usb when flashing. 6) If you wish to remove keys from token, you can use tool/gnuk_remove_keys_libusb.py from gnuk. Don’t forget to kill gpg-agent/scdaemon etc (whatever could be using the usb device). Thanks for your notes sarg. ad 5) : which operation caused the LED to blink? key generation or authentication? It was authentication. Key generation was way too slow (I have waited 10 minutes without success), so I have ended with generating key on my PC. Btw, do you think it is a good idea to add some timeout to wait_button function? It is possible but I think that it makes no sense. I’m currently stuck with this. I’m using a SL-Link V2 programmer to flash another one. So it seems that the flashing worked, but the vendor id was not set. I ran ./configure –vidpid=234b:0000 –target=ST_DONGLE so it should be there. Still doesn’t work. Can you share a working version of gnuk.bin? [ 32.370362] usb 3-6: Device not responding to setup address. [ 32.590349] usb 3-6: Device not responding to setup address. I tired also to flash the gnuk.bin with stlink. The flashing itself worked, but same issue still exists. 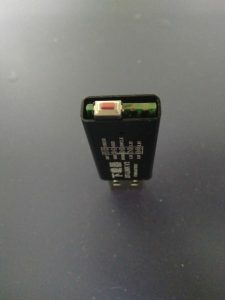 I don’t know if the cheap ST-Link V2 flasher is the problem or something else, because I currently only have this one. Ok with the help of danman i figured it out. Here is the way to flash the latest version of gnuk with a ST-Link V2 on a ST-Link V2. Now run openocd and connect to it via telnet as above. Follow it but leave out the flash step, because I used stlink(https://github.com/texane/stlink) for flashing, but it might work. Now I’m wondering how to upgrade for example. Do you know what to do ? What’s needed to erase/write a programmed flash ? On some web sites, they talk about being able to use the SWD RST which is not available on those cheap clones. I tried looping “openocd” and unplugging/replugging the programming key without success. Tips and tracks to dig would be very welcome. Also, thanks a lot for sharing about those cheap keys, that makes very affordable tokens! For me, the connection worked everytime. I have no idea what could help you. Perhaps there’s a way how to trigger SWD RST manually? I had a similar issue with flashing back from the Arduino firmware to gnuk. 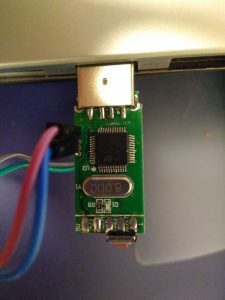 3. connect immediately to telnet and send “reset halt” and then flashing worked normally. 0x10000 is 65536 in decimal. I’m going to look into building a smaller gnuk image, but there may be different ST-Link sticks to buy. can you please share a photo of your device with readable chip markings? Huh. Nope. Unless by “chip markings” you mean the weird, striated etchings on the back of the chip where I would expect to see any identifier. I found out my chip has 128kB flash. But wow! I wonder why do they sand the markings down on your version. First of all thank you for this wonderful project! I’ve build several gnuk tokens before but the STLink clones seem to be quite nice as they already come with a case. Thanks for sharing this information! The stlink clones arrived and I was eager, to try to install a gnuk.bin to them. However the target board cannot be detected. My main workstation is a macbook so I use a VM to work with this, however I also tested with a plain Linux box with the same results. Can you see any obvious mistakes? If you have multiple STlinks yourself, I would greatly appreciate when you could create a follow up article describing how to use one stlink to flash another. 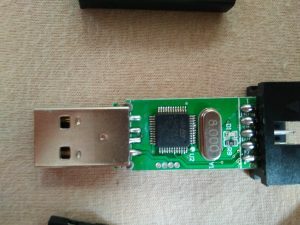 I do it like on the first picture here: https://blog.danman.eu/st-link-clone-as-stm32-dev-board/ . 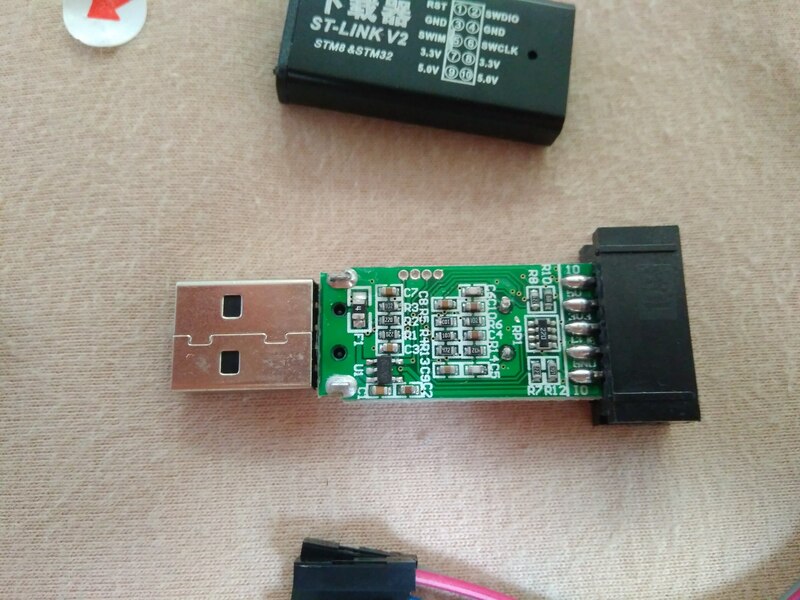 I only connect SWDIO and SWCLK because GND is common for all USBs and Vcc is suplied from onboard regulator. Found the issue. SWCLK was not well connected. However seems like the vendors learned that the stlinks get repurpossed. Seems like they set the Device Security Bit in level 2 that cannot be undone. Shows that it got unlocked. But flashing fails. I’ve also tried the Windows ST Link Utility that also complained about the Device Protection and said that it will automatically remove it. But it does not work either way. * Updated firmware of stlink to latest upstream version. Learned a lot in the process and again thanks for pointing to this neat device. However Marble Minis (baite) are easier to flash – especially as they do not come with Read Out Protection (and I think they set a flag to have a proprietary protection, as the Linux/GNU tools could not easily revert them). Thanks for sharing your experience. Maple minis are good choice but they do not come with nice aluminium case and are not so compact. But yes, they are much easier to flash. 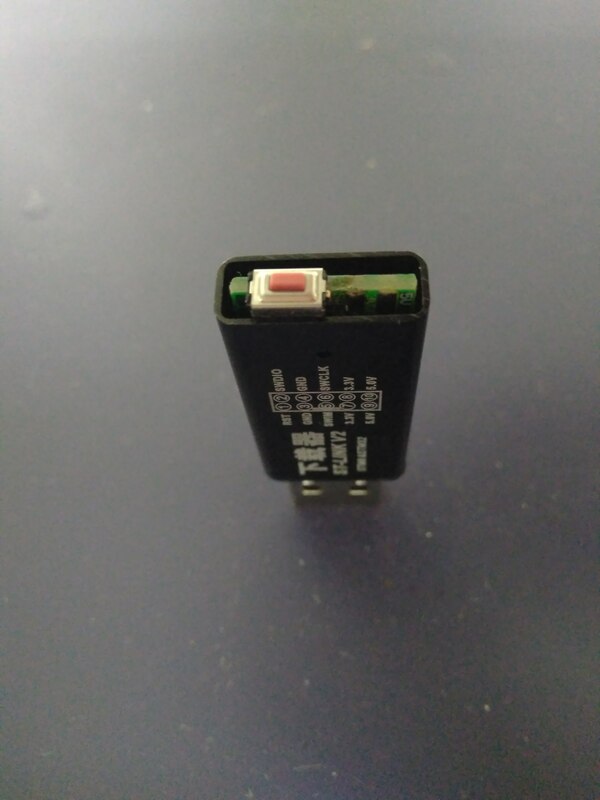 Anyone got an aliexpress link to a fitting button like the one used here? I’m struck at programming the board. I’ve bought few of these boards. So my plan is to use one to programs others. But I don’t know what to connect with what. Shall I connect SWDIO, GND, SWCLK, 3V3 of the programmer to SWDIO, GND, SWCLK, 3V3 the programmed? that’s exactly what you need to do, see the first picture in section Programming. You just replace J-Link with ST-link and that’s it. 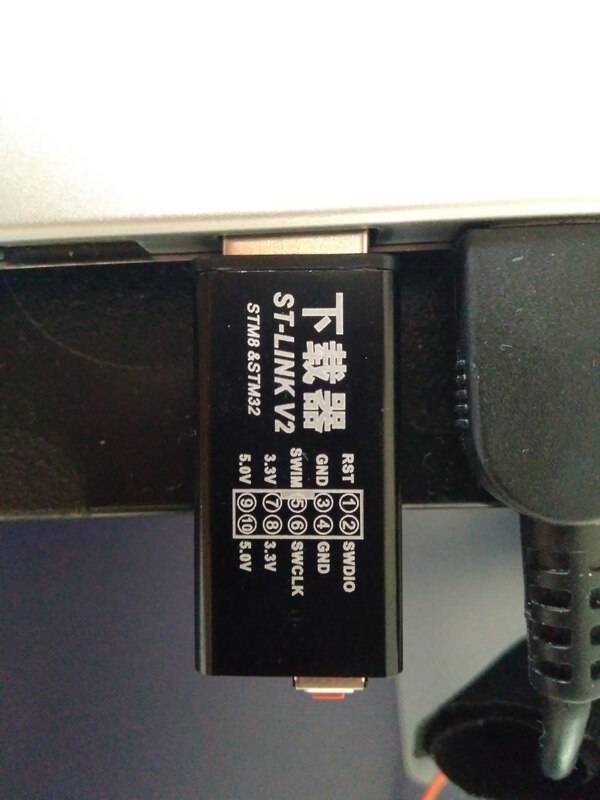 On the picture, I don’t understand why the ST-Link is plugged in the USB port of a laptop. I’d expect it to be powered by the wires. You are right, it’s a bit confusing, it should be disconnected but as soon as the STM32 CPU is halted by debugger it doesn’t matter. 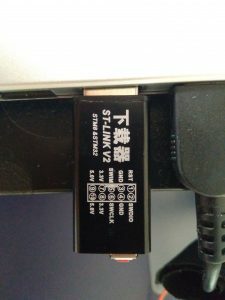 Where do I get the correct st-link? There seem to be versions with 64K and with 128K but the sellers don’t specify what version of the chip is used on their devices/clones. Anybody got a link where I can get the 128K version that is verified to be working with this? I’ve been tracing the ack button support in the latest commits and can’t for the life of me figure out how to use it. I can see that the button pin is defined under chopstx to be either PA2 or PA3 depending on the board id but it seems like the functionality has been implemented as part of the host token interaction as part of usb-ccid. If that’s the case then it is necessary for the host to request user ack rather than the token being set to use it right? If anyone has any light on the situation then feel free to reply!